New technology is making a huge difference to the lives of the people we support, giving them more choice and control than ever before. FitzRoy Malvern introduced some CleverTouch screens – a huge touch screen, like a television sized iPad – a few months ago, thanks to a grant from Karten. 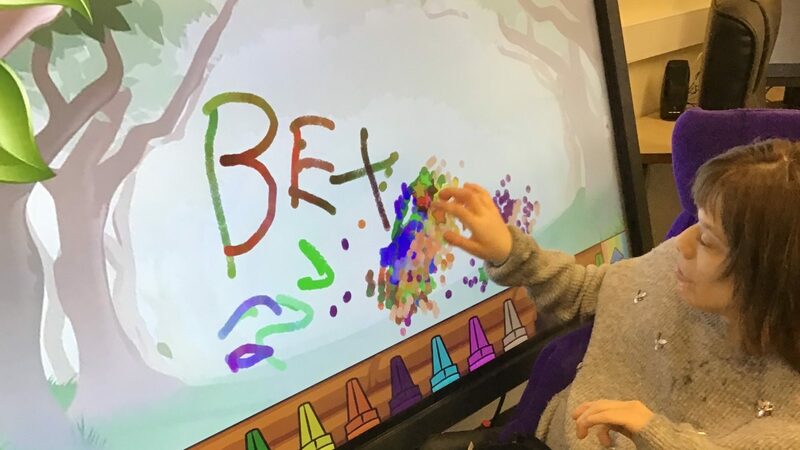 The people who live at Malvern are aged between 28 and 67, all have complex learning and physical disabilities and high support needs and they are engaging with the CleverTouch screen in lots of different ways. When we introduced her to the CleverTouch screen, Bex had never engaged with anything like it before. She loved using it for drawing and being creative, using the tactile pen and playing music. Her increasing confidence with CleverTouch enabled her to graduate to an iPad, on which she’s been using the MyChoicePad communications app, MyChoicePad uses Makaton signs and symbols to enable people to clearly express their feelings and make choices. One day, we showed Bex a photo of her mum and asked her who it was. She was able to press the button for ‘mum’ and when the app voice spoke the word, Bex was absolutely beaming as this was the first time she could express what she wanted to say using spoken words. The freedom the technology enables has worked wonders, she uses the iPad to Skype her family, it’s so much easier for her to communicate with them, she doesn’t need to wait for their visits, she can contact them whenever she wants to.